Aromatic herbs like Thyme are stimulating which allow them to get things moving or increase function. Increased function in the digestive system helps to increase appetite and promote digestion. Aromatic herbs are also Carminative which means they help to prevent or expel gas and therefore reduce bloating. All Carminative herbs are antispasmodics meaning they help to reduce cramping, griping and spasms in the gut. This would mean that Thyme would make a wonderfully effective digestive tea when there is griping, a feeling of stagnation, bloating and flatulence. Because of their high content of volatile oils, Aromatic plants have an affinity to the lungs. 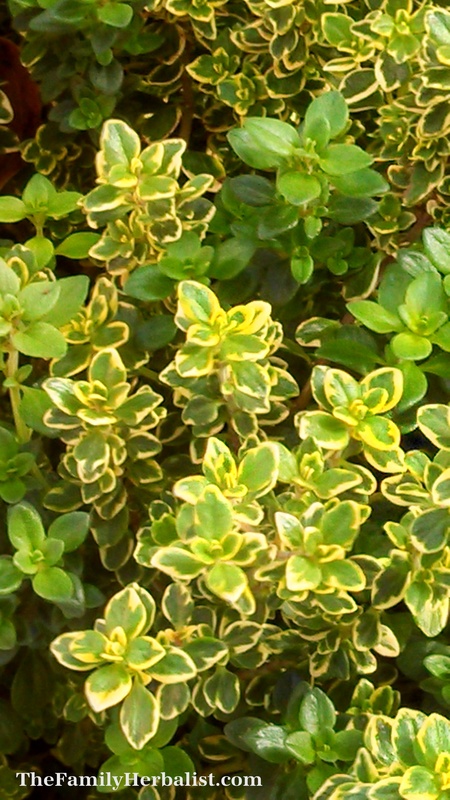 This makes Thyme a very useful herb for respiratory conditions. When there is dampness in the lungs such as a cough with lots of mucous Thyme not only helps strengthen the lungs but also helps to expectorate the mucous (or in other words… get it up and out of the lungs. Also consider Thyme for conditions such as upper respiratory infections, bronchitis and whopping cough. A warm tea made with Thyme will help to increase perspiration (diaphoretic) and is helpful for the first stages of a cold or flu. Thyme, like other aromatics, also has an affinity for the urinary tract and may be used as a tea when there is indication of a urinary infection or as an astringent for diarrhea and bedwetting. 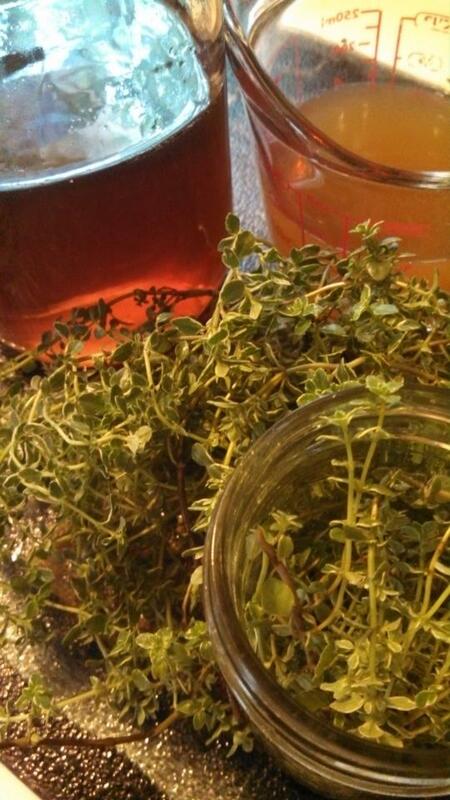 Thyme can be used in various preparations to include cooking, as a tea, in an herbal syrup or in an Oxymel. An Oxymel is a medicinal preparation which has been used for centuries. An Oxymel combines vinegar with honey and is considered not only tonic, but having an affinity for the respiratory system. On its own apple cider vinegar (ACV) is a remarkable healing agent. Whether used internally or applied topically, ACV is astringent (tighten and tones tissues) and antiseptic. Honey is a natural expectorant, helps to coat and sooth irritated tissues and is antibacterial. Honey also contains flavonoids and antioxidants which help reduce cell damage and support immune function. Place the Thyme in a small jar and completely cover with Apple Cider Vinegar. Add honey and stir. Cover the jar with either plastic wrap or a plastic lid (ACV will corrode metal) and set aside for 2-4 weeks. Strain off the Thyme, rebottle and you have yourself a Thyme Oxymel. This Oxymel is a very simple yet powerful remedy and can be used as a gargle for sore throats, for respiratory infections, whooping cough, lung congestion, damp coughs, urinary tract infections and during colds and flu. Place ½ ounce of dried thyme in a large open pot and pour boiling water over the herb. Place your head over the pot and cover your head with a towel to create a “tent”. Inhale deeply through the nose and do so until the head begins to clear or the water cools. Use caution as to not burn yourself with the boiling water. Your recomendation of making a tea and adding a little honey and fresh lemon slice worked marvelous for me last weekend. You are very welcome….glad you are feeling better. Thyme is a fabulous herb to have around the house and is so easily accessible to everyone. This is excellent information. I will try your preparations. Thank you. Thank you Marie…so glad you found this information helpful. How long can these be kept for? For the thyme oxymel- how much do you recommend taking and how frequently? I’m intrigued. In the initial stages of an acute condition I would use it frequently Shayna…about 1-2 tbsp every hour. As the condition begins to subside I would take it less frequently…about 1-2 tbsp every 4 hours or so. How this helps. I made this and the end result was just 4 oz of liquid which doesnt seem like very much after waiting 3 weeks….are you sure you can’t add more liquid? most remedies i’ve made like this call for filling the jar to the top with the liquid over the herbs. How do you make it for your family and how long does it last? Hi Jeanine…if the liquid doesn’t completely cover the herb by all means go ahead and add more of the vinegar. I don’t do much measuring for myself…basically I place the herb in the jar and cover it with vinegar and honey…voila!! If kept in a cool and dark place it can keep at least 6 mths. You can also keep it in the refrigerator almost indefinitely. I usually just make it in small batches and it usually goes quickly. Enjoy! !